If you have a lock related issue, you need a locksmith you can trust. Cathedral Locksmiths are a team of C&G qualified with four years of experience in the trade. Cathedral Locksmiths offer a range of services from emergency call-outs to key cutting and lock fitting. They aim to provide an extremely efficient, fast response service, aiming to attend all call-outs within a 30 minute time period. John and Guy, directors of Cathedral Locksmiths, contacted us requiring a website for their new business venture. 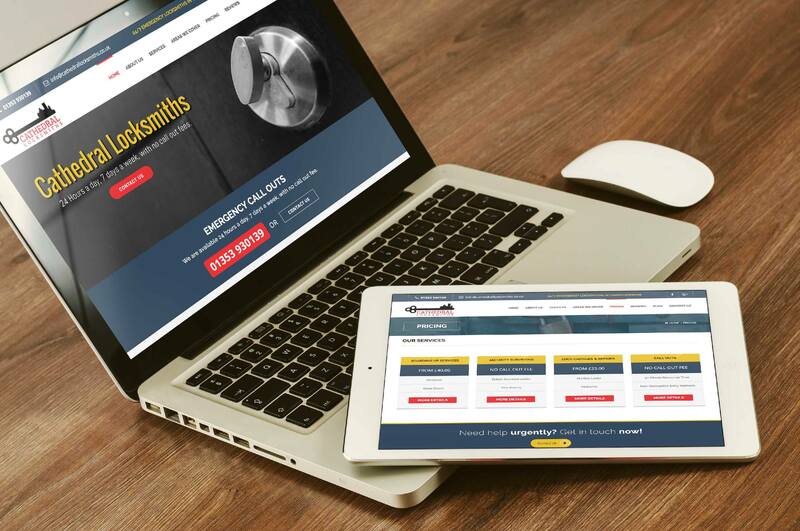 We developed a website using WordPress that demonstrates the range of services that Cathedral Locksmiths offer. A large emphasis was based upon their main service, emergency 24/7 call-outs. Because of this, clear, aesthetically pleasing call to actions are used frequently throughout the website, drawing in website users to call and get in touch, without the need to navigate around the website in search of a telephone number. Client Feedback: Friendly and professional staff. Website designed to a high standard. Would recommend to anyone.